Interior designers encourage homeowners to include a statement piece in each room. That decorative item can be a unique piece of furniture or an impressive accessory. It's a feature that immediately captures everyone’s attention when they walk into the room. A decorative statement item isn't limited to your interior décor. Walkways, driveways and garden pathways can be designed so that they are eye-catching elements in your landscape design. While your first inclination may be to consider the aesthetic appearance of your walkway, safety should initially be your main concern. You want to design a walkway that is wide enough for two people to walk side by side comfortably. While four feet is generally a safe width, a walkway width of five feet is significantly better. It’s important that visitors to your home can easily walk to your door without running the risk of stepping off a narrow walkway. It’s important to keep the shape of your walkway in balance with the size of your yard. If you have a small yard, a straight walkway, in a width of five feet, would be an attractive and safe size. A curved walkway looks lovely in a large yard. It’s best to limit the number of curves you include in the design so that visitors don’t feel as if they’re making their way through a maze to get to your front door. To achieve visual cohesiveness, the style of your walkway should complement your home’s exterior architectural style. Curved walkways complement a ranch style house while a straight walkway is more compatible with a traditional or formal architectural design. The material you use for your walkway has an influence on the appearance, durability and safety of the walkway. A gravel walkway has an uneven surface which makes it uncomfortable and unsafe to walk on. Pavers are a durable walkway material that is comfortable to walk on. 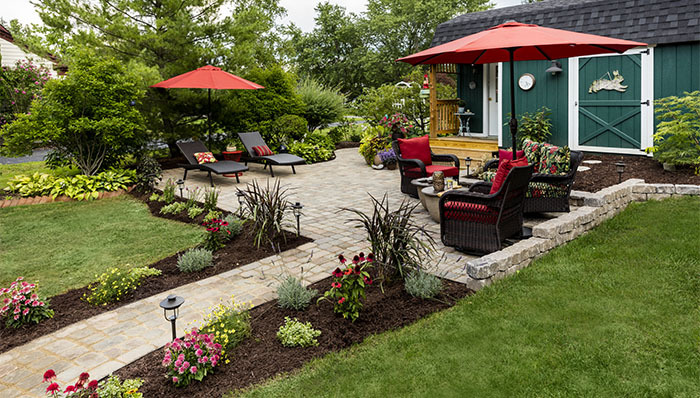 You can create a walkway that includes pavers in colors that complement your home. Pavers can be arranged in designs that ultimately make your walkway a work of art in the landscape. When designed well and constructed with quality materials, walkways and driveways can enhance the curb appeal of your home. They can also increase the value of your home.